On the occasion of 2018 World Day to Combat Desertification and Drought, let’s remind ourselves to BE PREPARED, KNOW THE RISKS & TAKE ACTION to combat drought. “Land has true value – invest in it” is this year’s slogan. Climate change is expected to increase frequency, duration and severity of droughts in many parts of the world. Such changing conditions will add to already stressing land use. Temperature increase and more frequent dry periods will contribute to acceleration of desertification risk also in our region. DriDanube is contributing to UN Convention to Combat Desertification with the development of pro-active risk management at national and regional scales. 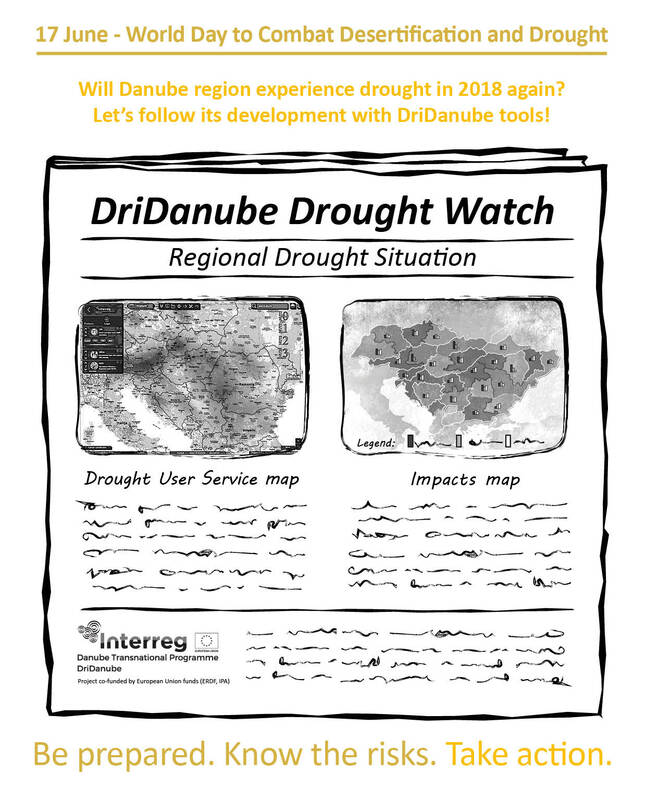 DriDanube partners are working more than a year on developing practical tools that will help the stakeholders with more accurate and efficient drought monitoring and early warning. Drought User Service (DUS) is one of the tools that will combine data from the satellites, meteorological stations and drought impacts reports into ready-to-use drought information available to public through web-browser interface. We decided to test the prototype of our DUS and our constantly growing reporters network this summer and to monitor the drought situation in the Danube region. We will be regularly publishing the Regional drought bulletins, together with the maps documenting the situation, within the Drought 2018 Watch section of our project webpage. Be aware and be prepared! Follow the drought situation in the Danube region with us and take action before the next drought causes irreversible losses and damages again.